Wolfgang Köhler (1887-1967) was a German psychologist who contributed to the body of knowledge known as Gestalt psychology (though his PhD at the University of Berlin had been in psychophysics during which he had studied with Max Planck and Carl Stumpf). A Wikipedia article on him is HERE. In 1913, Köhler took up a position in Tenerife as the director of the Prussian Academy of Sciences anthropoid research station. 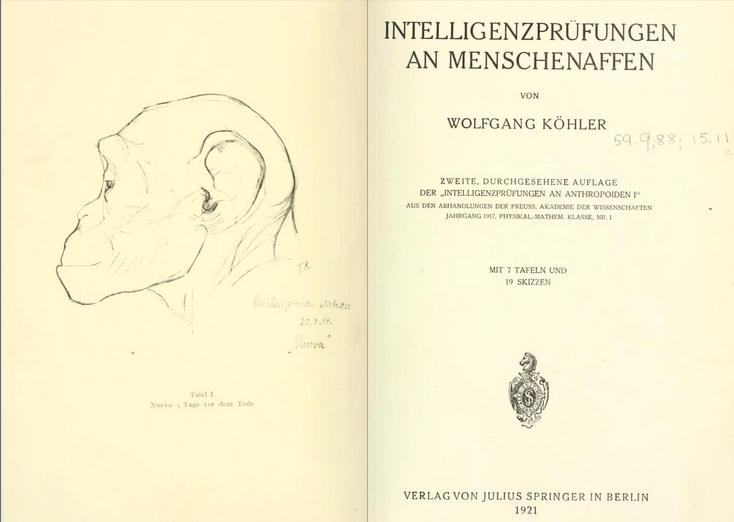 During 1914 Köhler undertook some seminal experiments with chimpanzees, in which he set them difficult but not impossible tasks to understand how the chimps solved problems. Based on these observations he published a book in 1917 on problem solving entitled Intelligenzprn an Anthropoiden (The Mentality of Apes). A 1921 edition of this is HERE. One of the key findings of Köhler, described in The Mentality of Apes, was that chimpanzees were capable of problem-solving and that they did not arrive at their methods through trial and error; they exhibit insight and show several of the typical intelligent behaviours that common in humans. An English translation of the book was published in 1925. The primate research centre in Leipzig is named after Köhler (HERE) .